1.In a sautee pan melt down the butter. Cut habaneros in half and put in butter with your chopped onions. Keep butter on a very slight simmer but not too much or it will burn or turn brown. Keep this going for about 10 - 15 minutes. Take the peppers out of the butter and throw away. 2. Pour butter and onions over chicken (save a little for your rice). Very litely drizzle honey and then sprinkle a little brown sugar over your chicken. Sprinkle your garlic and basil over chicken. Put tomato slices on top add you salt and pepper then bake your chicken at 350 for 30-45 minutes untill done. Half way through if you want, spoon some of the butter/sauce out of the of bottom pan over the chicken. 4. Cook yellow rice with some of the habanero butter, Serve chicken ontop of the spicy rice. This also goes good with a touch of mango salsa. Delicious flavor. Not too hot but a warm flavor. A bit of chicken boulion in the rice also adds a rich flavour as long as sodium is not an issue. the directions were easy to understand. Absolutely wonderful! yummmmmm love chicken. 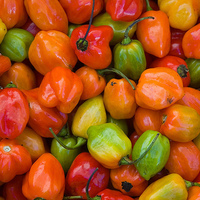 love habanero. I am gonna try this out :) Thanks! As always - a great recipe! This sounds like a great recipe! I can't wait to try it! Sounds good especially with the yellow rice and cornbread. Great job Daniel! Can't wait to try this spicy recipe! I love anything cooked with habaneros. This sounds like a great recipe! This is a great recipe! I cooked it last night at a friend's recommendation! Loved it! My mom made this last night. I LOVED it!!! Thanks for the great recipe - I was looking for a way to spice up chicken without too many ingredients - your receipe keeps it simple and tastes amazing - I look forward to trying more of your creations! Thanks for a break from the grill. My wife tried this recipe and our whole family loved it. Great job man! Mom made it, a little spicy but I really liked it because she made rice with it and it tasted really good together. Cool recipe for sure. I love chicken and everyone knows that so when we had it this way and it was spicy I was loving it - thanks for mixing it up bro! I waited all week to make this for Saturday football and when I went to make it yesterday my chicken had gone bad, so I had to use porkchops instead and it was soooo good! We even had leftover porkchops for breakfast. I can't wait to make it again, but with chicken!! mmmmmmmmm sounds good!!! i can't wait to try this! I like the suggestion about mango salsa, so I used it when cooking this recipe and it was as great as I expected it to be!! I don't really like rice, so I used this recipe minus the rice and served it with salsa in soft tortilla shells... it was SO good! Thanks so much. You probably saved my marriage! I made this for our Thanksgiving recipe competition. It was delicious. Definitely spicy, but the flavor doesn't burn or linger...but melts away. A very nice dish! Hi Daniel, I enjoyed the habanero chicken....I like the poached in butter method which left the chicken breast extremely moist and juicy. The flavors were very subtle (a good thing) despite its name. I made this recipe tonight for dinner...wow DELICIOUS! I love spicy food, so I decided to add 6 habaneros. I would suggest sticking to just 3 or 4...wow was it spicy. I loved the flavor though. Loved all of the onions, garlic spices and tomatoes on top. I will be making this again! Thank you for this simple but very flavorful dish! This was absolutely delicious. I made it with a homemade mango salsa to serve over it. My husband still can't stop talking about it. He thinks the habanero butter should be put on everything...even popcorn! Amazing......made with chicken thighs as that is our preference over chicken breasts. Very easy to make; the addition of brown sugar adds a note of sweetness that is not overpowering but adds a nice note to contrast the heat of the habanero. This is absolutely fabulous. The flavors are incredible and has become my go to amazing meal for the last three years. I LOVE it! Wow, what a nice recipe! Great recipe, Daniel... a big thumbs up!